We’ve been heavily reliant on the WWDC logo to offer some kind of indication as to the changes to be made with iOS 7, and with just a weekend now to go before Apple’s WWDC 2013 kicks off in Moscone West, the Cupertino company has confirmed the logo of the forthcoming software. As we’ve come to assume from the reports and rumors of late, the next version of iOS will be very much a clean-up job, and this demonstrated rather emphatically by the new logo. Take a look after the break! A few days before any big tech event, the company or companies involved cannot help but to leave tell-tale signs lying around, and so it has proved as Apple begins dressing up Moscone West ready for the big WWDC 2013 kick-off this coming Monday. 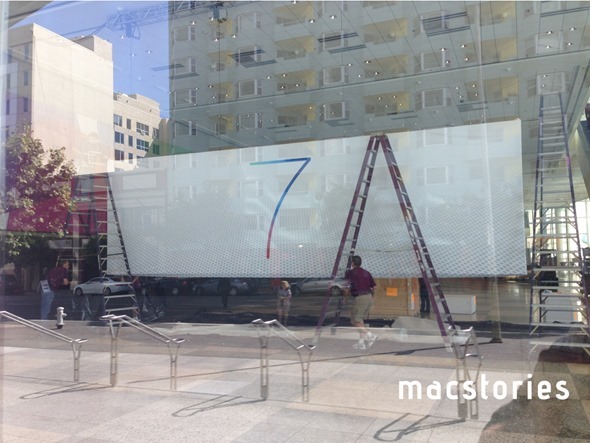 As you will see from the image below, a large, plain white banner simply showing the digit "7" confirms the logo of the hottest topic on the menu for next week – iOS 7. As you’ll surely be aware right now, hardware lead Jony Ive has been tasked with the job of controlling the visual aspect of iOS 7, and with the Englishman noted as being a staunch loather of skeuomorphism, his role has been as much about cleaning away the realistic effects throughout the OS as it has been innovating and bringing his own ideas to the fold. As such, many reports have suggested that iOS 7 will be the most radical change to what has become a rather mundane aesthetic in the eyes of many. Resident Apple insider Jim Dalrymple recently noted that while the changes will be noticeable, they will not be as extreme as some have purported, so we’re perhaps expecting a rather simplified version of what’s already here. The event proceeds from Monday, and we’re certainly eager to see what Apple has been hiding for these past few months. It will also be rather nice to put all of the rumors and speculation to bed and concentrate on the products, but with three days still to go, don’t be surprised if the concept makers and designers decide to have one last hurrah! We’ll be covering all of the WWDC announcements here at Redmond Pie, so stay tuned!